Last time we talked about where the problem lies. When we map the distribution of visible mass in a galaxy and calculate what the motion of stars should be in that galaxy, it doesn’t match the motion we see. The stars in a galaxy move as if there is ten times the mass we observe. Observations of the cosmic microwave background indicate that our measurement of galactic mass should be correct, but observations of gravitational lensing by galaxies agree with stellar motion. Something just doesn’t add up. The observations of galaxies, the cosmic background and gravitational lensing have all been consistently observed, so it is reasonable to presume they are correct. So if we start with that, then we have a correct measure of mass in a galaxy, and the problem is that stellar motion and gravitational lensing don’t agree with our gravitational theory. Obviously the theory must be wrong, and we need to come up with something better. One alternative with a lot of potential is known as Modified Newtonian Dynamics (MoND). The basic idea of MoND is that the acceleration due to gravity differs from Newton’s model at very large distances. In Newton’s gravitational model, the force of attraction between masses decreases as the distance between the objects gets larger and larger. This means with greater distances the acceleration is smaller and smaller. According to Newton, there is no limit to how small the acceleration can get, which is why distant stars in a galaxy should move much more slowly than closer stars. In MoND, the acceleration doesn’t taper off toward zero with increasing distance. Instead, the acceleration levels off at a very small value, about 10 trillionths of the acceleration of gravity near Earth’s surface. This might seem to be so close to zero that it doesn’t matter, but the gravitational pull on a star by its galaxy is pretty tiny for stars outside the central region. So even this tiny extra acceleration is enough to ensure that stars in the middle of the galaxy move about as fast as stars at the outer edge, which is the type of motion we observe. There are a couple of difficulties with MoND. One of the biggest is that the remnant acceleration would seem to violate fundamental aspects of physics, such as conservation of momentum. But proponents of MoND have demonstrated that there are ways of tweaking things to ensure that the basic laws of physics still hold. It make the model a bit more complicated, but it gives the same type of predictions as the basic model. The key point is the MoND has been developed as a consistent gravitational theory, and it agrees with the observed motion of stars in a galaxy reasonably well. Any deviation from the theory could be accounted for by a small amount of cold gas or dust in the galaxies that we just aren’t seeing (but nowhere near the 90% needed to agree with Newton). Since MoND is a modification of Newton’s gravity, it doesn’t explain the gravitational deflection of light by galaxies (gravitational lensing). For that, the theory needs to be extended to include relativity in the same way Einstein extended Newton. There are two slightly different models that do this. One is known as Tensor-Vector-Scalar gravity (TeVeS), while the other is known as Scalar-Tensor-Vector gravity (STVG). These two models differ a bit in their technical details, but they both predict that light should be deflected more by a galaxy’s mass than Einstein’s model predicts, and they both agree with the gravitational lensing that is observed. So MoND and its relativistic extension accurately describes stellar motion and gravitational lensing in a way that agrees with the amount of mass we observe. There are some problems with the model when it comes to fluctuations in the cosmic microwave background, but not enough to discard the model. After all, it is still a work in progress. It would seem then that we have a likely solution to this puzzle. But modifying gravity to agree with observation isn’t really enough to overturn the theories of Newton and Einstein, which not only agreed with observations of their day, but also predicted phenomena that were later confirmed. To really nail down a theory as valid we’d like to see the model make a clear prediction that can be tested. Even better if this prediction differs from the alternative “dark matter” model. It turns out that there is such a prediction. Modified Newtonian Dynamics still depends on the gravitational attraction between masses. This means that the acceleration of stars in a galaxy has to be about the central bulge where most of the mass is located. The stars can move faster than Newton and Einstein predict, but they should still orbit the central region. In the same way, the gravitational lensing should be centered on the central bulge of a galaxy. Put another way, the distribution of mass as measured by gravitational lensing and the distribution of mass as measured by direct observation should agree with each other. In 2006 this prediction was put to the test in an analysis of two colliding groups of galaxies known as the Bullet Cluster. Astronomers measured the distribution of mass by direct observation of stars, gas and dust, and compared it to the distribution of mass as determined by gravitational lensing. You can see the result in the image above. 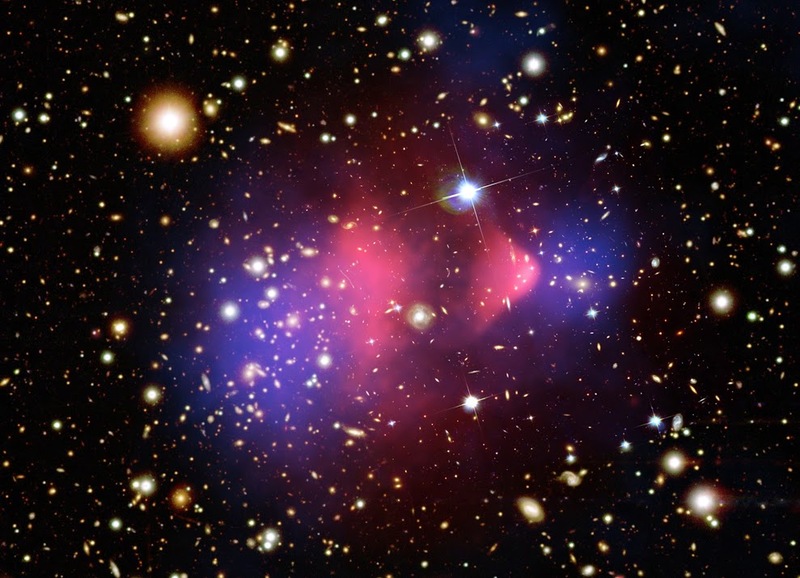 It is a false-color image of the cluster, where the pink regions indicate the mass distribution as measured directly, while the blue regions are the mass as measured by gravitational lensing. As you can see, the distributions don’t agree at all. Direct observation puts most of the mass in the center, while lensing puts is mainly on the outer edges. While the Bullet Cluster shows the greatest difference between the two methods, a similar difference has been seen in other colliding clusters. It is a real and verified effect. So a clear prediction by MoND has failed. Since the Bullet Cluster and others were observed, proponents of MoND and similar models have countered with some modifications that could explain part of the discrepancy, but modifying a model after failing a prediction doesn’t carry much weight. This is particularly true when there is a competing model that not only correctly describes stellar motion and gravitational lensing, but also correctly predicted the results of the Bullet Cluster. That model is dark matter, and we’ll talk about it next time. This is intensely interesting (well, all of your writings hold my attention, but this one, especially) and one of the directions that I’d hoped you’d pursue. There is a certain pressure (intrigue?) when you write about topics of intense hypothetical speculation. Though you add that element of discovery to your usual discourse you truly shine when it comes to more current hypothesis’. KUDOS & Thanks! Galaxy clusters are spheres of bubbles where stars stream on electrical filaments because a cold transparent superfluid center connects the structure by quantized electric current vortices having a fixed spin rate carrying the angular momentum. See my website that explains the Bullet cluster.